Rare ‘Presidential Masterpieces’ short prints and wondrous entomology set featuring all new butterflies, bugs and beetles highlight sought-after collection! Carlsbad, CA (July 1, 2011) – As the 2011 professional baseball season readies itself for its annual Mid-Summer Classic later this month, the Upper Deck Company is excited to release its second baseball-themed trading card set of the year: 2011 Goodwin Champions! The 231-card regular set features an impressive array of baseball legends and prospects plus memorable champions and standouts from many other sports as well! "This release will really make an impact,” said Grant Sandground, Upper Deck’s product manager. “The combination of signatures, hand-painted images, animal kingdom patches and museum collection relics, not to mention the continuation of the Entomology bugs cards, truly provide something for every level of collector!" The box break summary is enticing to say the least, with three of the following four categories guaranteed (on average): hard-signed autograph cards; single- or dual-swatch memorabilia cards; embroidered animal patch cards; and 1-of-1 printing plates! In addition, on average, collectors can expect to yield 10 Goodwin Champions Minis per box; one “Figures of Sport” die-cut insert; one “World Traveler (5” x 7”) box topper; and one “Goodwin Citizen” insert card consisting of notable historical figures including Louie Pasteur, Herman Melville, Walt Whitman, Jules Vern, Louis Vuitton and Vincent Van Gogh. 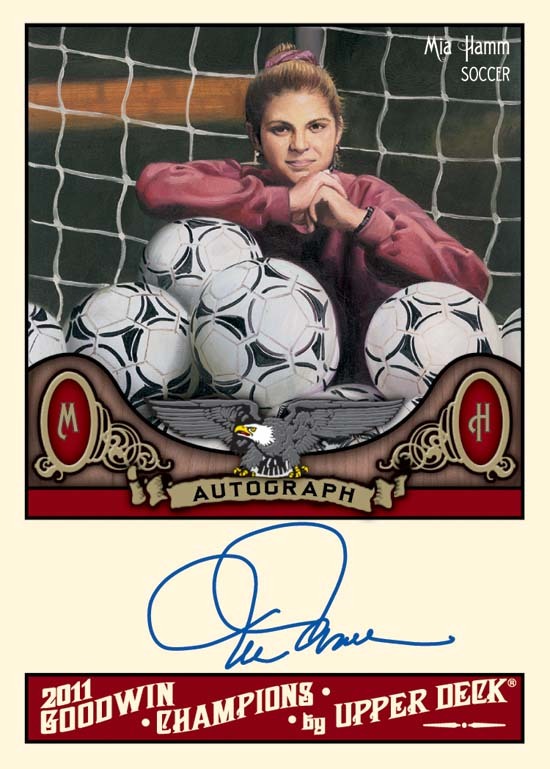 Outstanding best describes the phenomenal lineup of hard-signed autograph cards found inside 2011 Goodwin Champions. A total of 84 sports stars have signature cards including Alex Ovechkin, Annika Sorenstam, Bode Miller, Chris Paul, Nolan Ryan, Bill Walton, Steve Carlton, Carlton Fisk, Candace Parker, David Robinson, Walt Frazier, Greg Louganis, Mia Hamm, Bo Jackson, Johnny Bench, Janet Evans, Jim Rice, Larry Bird, Bubba Watson, Landon Donovan, LeBron James, Johnny Miller, Michael Jordan, Michelle Wie, Mark Spitz, Wayne Gretzky, Ryne Sandberg, Bobby Orr and Tiger Woods. This release marks the first time that both Watson and Wie will have autograph cards appearing in a trading card set. The base set alone features 150 regular cards, 40 short prints, 20 super short prints, and 21 high series minis short prints. A brand new element to this year’s release is an impressive array of hand-painted “Goodwin Masterpieces Presidential Series” cards showcasing all 43 U.S. Presidents. 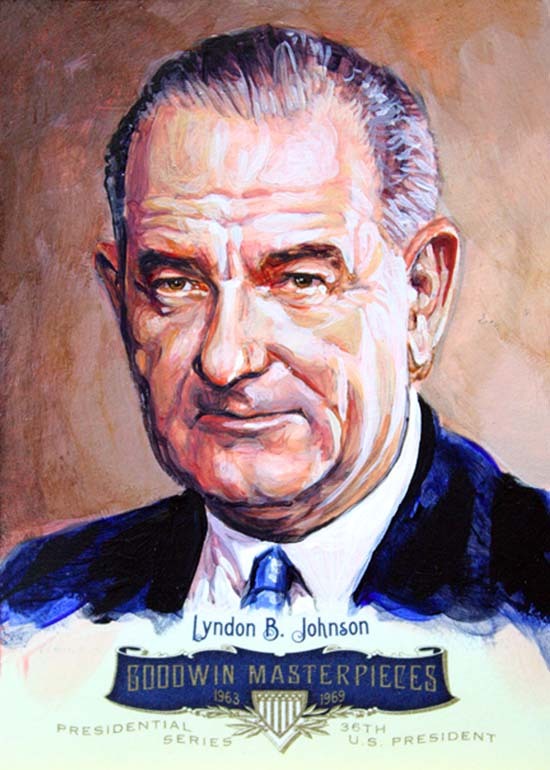 Each President has a total of 10 hand-painted cards which provides collectors with the opportunity to build a full set. Another new addition to the 2011 version is an insert collection entitled “Museum Collections Relics” which includes extraordinary rarities from historical icons like Abraham Lincoln, Annie Oakley, Napoleon, The White House and even the Spirit of St. Louis! But wait, there’s more; “Animal Kingdom” patch cards make their Goodwin Champions debut as well. Seek out cool patch cards spotlighting the likes of such incredible animals and mammals like the salt water crocodile, the red-eyed tree frog, the North American Moose, the King Cobra, the humpback whale, the great white shark and the African elephant. The Animal Kingdom cards are all seeded at different rations based upon the featured animal’s actual endangered species status. Finally, rare Thoroughbred Hair Cuts cards return to the mix featuring Kentucky Derby winner Super Saver and 2007 Preakness winner Curlin. Upper Deck’s 2011 Goodwin Champions Baseball set boasts five cards per pack, 20 packs per box, and is available on store shelves now.